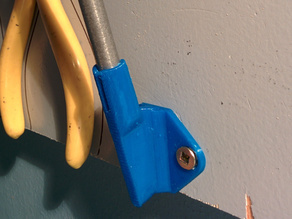 Thanks for sharing this holder in OpenSCAD! It allowed me to slightly tweak it. I made a holder that I use while working. I enlarged the base plate to provide space for a clip, and made the entry hole for the knife cone-shaped for easy entry. Works brilliantly! Excellent! That's the greatest thing with 3D printers: solve problems! BTW: you can put a cable tie around the handle to prevent it from rolling around. Yep, I've used zip ties, pencil erasers and even drilled and tapped the sides for 4-40 bolts. Doesn't stop me from knocking them off the bench puncturing various body parts. With this holder I now have a place to "park" the 3 or 4 Xactos I usually have on the bench during a build. Awesome, Nice tweaks... Would love to see the updates you've made to the OpenSCAD - the cone shaped entry sounds like a great idea!